Terraform planets with the help of ancient loot. 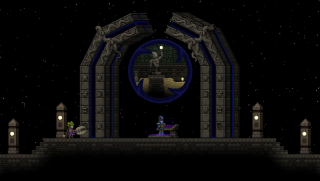 Starbound has just received a whopping update that adds Ancient Vaults, which, as you may have guessed, are chock-full of Ancient Loot, Ancient Bosses, and Ancient Stuff You Can Use To Terraform Planets To Your Liking. To access the crafting-sandbox game's procedurally assembled dungeons, you first have to finish the main storyline, and then chat with a "mysterious" trader at the Outpost, who will send you on a quest to activate the Ancient Gateways "found floating in some systems". You can see one above, and while it's definitely not a stargate, it totally is a stargate, and that's pretty cool. Wait, what was that about terraforming? Well, after you've explored the aforementioned vaults and defeated the equally procedural vault guardians, you'll probably have acquired one or more of the ancient devices contained therein—devices that will allow you to "transform regions or whole planets into entirely different biomes". Terraformers "can be used to expand a region across a planet’s surface, replacing natural blocks, objects and plant life, and eventually changing the type of the planet itself", while Microformers are "consumable single-use terraformers which provide even more region types to add to your worlds". Exciting stuff. Bug fixes, festive items and other tweaks round out the enormo-patch, and if you want the nitty gritty you'll find the full patch notes here.